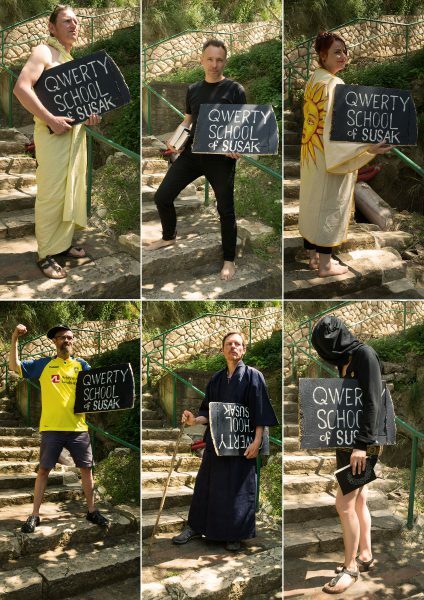 At Susak EXPO 2018, the Danish art group QWERTY, were inspired by the renaissance painting by Raphael; The School of Athens. QWERTY performed 3 days in a row, at the main staircase between upper and lower Susak 8th-10th of May 2018. The form was lectures/talks/performances from each artist. All QWERTY members came to the remote island of Susak to find their authentic selves. -The literally search in finding oneself, using different philosophers as inspiration. Asking the audience to rephrase the sentence “ I will find my self”. How could that sound? And after that, along with the audience, develop strategies to succeed, and try them out on one self. -The role as passionate football enthusiast, and the love for teaching watercolor painting. A combination of a hooligan, an expressive performance, and drawing lectures. -A presentation of the 180 cognitive biases, that we are guided by, in our decisions. Supplied with personal experiences as examples. -A manifestation of the hippie jacket, a personal history of loosing her self as a 10 years old girl, moving to another country and being teased by young girls. The jacket took a journey over 3 days being rinsed by the 4 elements. -Finding and studying the making of intuitive portraits. Finding the aesthetic expression. Trying to find the way into a meditative state, where it becomes possible to see through and around the person you meet. -Philosophical talks about finding yourself as a person and as a person in a nation. The impossible idea of a perfect state. Some failed to find themselves, others found themselves mirrored in the group and audience. We all found pieces of our inner authentic selves, on the personal quest, walking along the dusty and beautiful paths of Susak.